Social media fools us with images of yoga teachers… posing on beaches, in busy traffic, on top of mountains. Do you think that yoga teachers must delight in being in the limelight? Have your dreamed of studying yoga or teaching, but dismissed your musings because you’re an introvert? I enrolled in a teacher training twelve years ago because I loved the way yoga made me feel. My stress melted away, I didn’t feel quite so lost, and I stopped criticizing myself. I prefer intimate gatherings to huge parties. I need time alone when I can think. I don’t usually strike up conversations with strangers. People call me mellow, grounded and thoughtful. 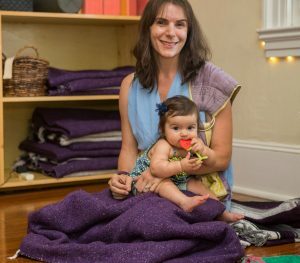 I’ve taught yoga for 15+ years and run a studio for almost 10. Being an introvert isn’t an obstacle to becoming a yoga teacher. In fact, the qualities of an introvert build inspiring yoga teachers. But if you’re an introvert you might feel like you’re just not cut out for teaching yoga. As an introvert, I’ve learned from experience that when I lead with my own voice, even when it’s quietly confident, people pay attention. You can let go of your own limiting thoughts too. Effective yoga teachers come in all sizes. The best teachers let their inner light shine out, whether it’s neon purple or soft and cozy. We see images in social media of yoga teacher “superstars” who like being in the limelight. We think this defines a yoga teacher, but real yoga isn’t fancy postures. It’s so much more. Why do you love yoga? How does it make you feel? Great teachers master the art of guiding students past their own patterns and limitations. Many teachers focus only on the physical postures, but postures are the tip of the iceberg. The transformation comes when you dig a little deeper. Before teaching yoga, you need to understand yourself, understand what assumptions you have about the world around you, understand how you put people into categories, and finally see how this limits your connection. Let go of your own assumptions about yoga teachers. If you love yoga, then study it more. Teacher trainings are a path to deeper understanding of yoga, even if you don’t want to be a teacher. When I enrolled in a training I had no intention of teaching yoga. I thought I’d never teach because I’m an introvert. After the training I wanted to share the yoga. Share what had helped me to get to know myself. I felt highs and lows, and I was no longer afraid of facing my unhappy job situation. I taught my first public yoga class in Paris, in French. I was terrified. It probably wasn’t the greatest class ever. But afterwards, I felt a new confidence. And for the past fifteen years, I’ve continued to study yoga philosophy, anatomy, and Ayurveda. When I studied yoga for longer, I saw how my own thoughts limited my dreams. I assumed I couldn’t be a good yoga teacher because I’m not naturally exuberant. But over time I’ve learned that building a rapport with students is more important than entertaining in a yoga class. Do you want to write, study yoga, or create art? Are your thoughts telling you that you can’t? A yoga teacher training builds your confidence and connects you to your true voice. You’ll need this when you teach yoga from your heart. What about charisma? Do you need it? Introverts and extroverts can be charismatic. Charisma is a combination of warmth, power and presence. The Charisma Myth describes ways to cultivate each of these qualities to become charismatic. Warmth: If you’re shy sometimes you can appear cold. I’ve learned to smile, make eye contact. And I’m genuinely curious about why people want to do yoga. So I talk to them about it. Presence: Yoga teaches you to be present in each moment, to notice your distracted thoughts and come back to the present. When teaching yoga being present with your students is one of the most important qualities. And this has nothing to do with being introverted or extroverted. Power: An excess of power is negative. But simply being confident in your message is powerful. Knowing that you have something to share and it will help people. As a yoga teacher, you’ll use your qualities as an introvert to be a thoughtful and inspiring yoga teacher. Spending time alone energizes introverts while spending time with other people energizes extroverts. Introverts are great at thinking, planning, and listening to their students. Reading and self-study is one of the integral parts of the niyamas, or codes of behavior described by Patanjali. Extroverts thrive when they are leading a group. Your introvert qualities of sensitivity, intuition and compassion make trustworthy yoga teachers. You can use your intuition to sense students energy and to listen attentively. In a Teacher Training, you learn to meditate so that you see the contents of your mind. At the end of the training, you’ll start to understand your limiting thoughts. You’ll also learn to embrace your strongest qualities. Great teachers are authentic, and they aren’t afraid to be themselves. We are all perfectly imperfect. Allowing yourself to be vulnerable helps you to connect with students. Fifteen years ago, I enrolled in a teacher training. I had no idea where this road would lead me. It wasn’t always easy, but it’s been immensely rewarding. If you’re interested in learning more about a yoga teacher training, read about ours here. The training will help you to find your voice, whether you want to teach or not. You don’t have to mold yourself into what the media portrays as an ideal…whether it’s teaching yoga, writing, or just expressing yourself. If you think you’re interested, take the first step, apply now. P.S. Join us for an info session Thursday June 15th at 6:30pm or Thursday August 10th at 6:30pm.